Identifies the most promising research in the affordable housing field: useful resources, areas where additional research is required, and barriers to the implementation of design solutions. Includes recommendations for Research and Action in the areas of Pedagogy, Outreach, Research and Vision. 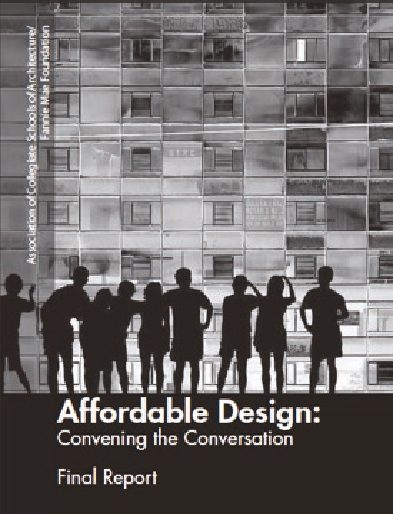 Kathy Dorgan was principal investigator for the Association for Collegiate Schools of Architecture (ASCA) and Fannie Mae Foundation Conference and publication Affordable Design Convening the Conversation. 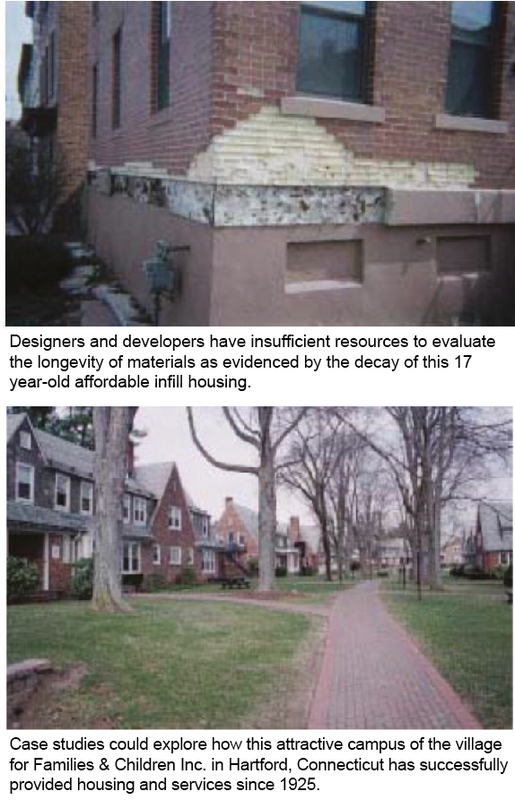 Design successes come about when design is used to meet the needs of the various stakeholders in the envisioning, financing, construction, and occupation of affordable housing. One key element singled out repeatedly during the project was the value of design thinking to critically evaluate and solve problems when several competing opinions and options are at play. As detailed in The Art of Innovation by Tom Kelly and as is being explored in Stanford University’s new “d.-school,” deign thinking can be employed to analyze and solve problems in new ways. With this in mind, Convening the Conversation brought together some of the most accomplished designers and analysts of affordable and mixed-income housing with leaders in the production and financing of such housing to gain greater insight into possible strategies for improving outcomes in affordable housing. Design successes can also be scaled up to bene t communities. 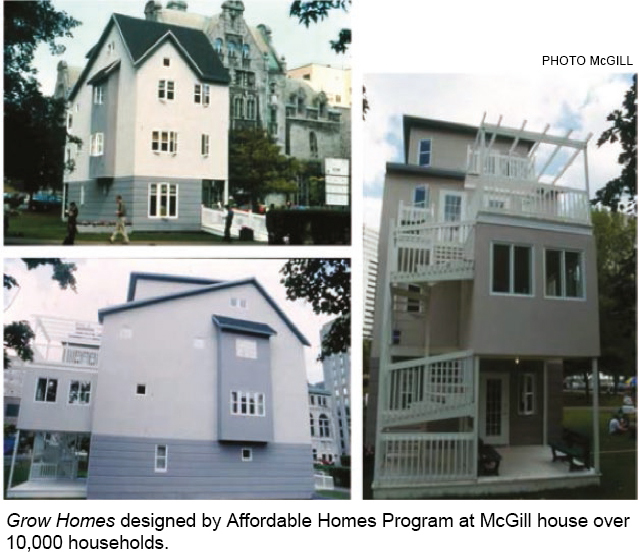 An efficient model home designed by the Affordable Homes Program at McGill University, led by Avi Friedman, has resulted in the production of 10,000 unsubsidized units of housing that are affordable to families with incomes as low as that of the poverty level in Canada. One design success story is the use of railings designed by artist Seitu Jones at the pond overlook of a HOPE VI project in Minneapolis. These elegantly designed railings feature important icons from local history and the environment. Yet, the cost of this installation was less than that of the ubiquitous standard DOT barrier. e community treasures the grace of these sculptural elements, and management has adopted the design as a feature element in marketing materials. Participants discussed a wide variety of needs. The following items were identified as achievable midterm objectives most inline with the capacity and priorities of ACSA. Inventory of teaching methods for affordable and mixed-income housing within North American schools of architecture. Recognition programs for excellence in teaching and student work in affordable and mixed income housing within North American schools of architecture. Partnerships with national organizations that will facilitate engaged learning in affordable and mixed-income housing design. Transdisciplinary engagement — through a summer affordable housing institute.